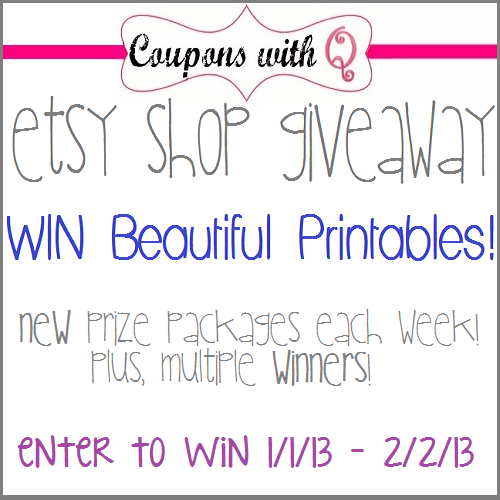 We are helping the Coupons with Q Etsy shop celebrate one year in business with some great printables giveaways! She is offering a great Buy 1 Get 1 Free sale for the entire month of January! Every week we will be having a new giveaway with a package of printables so you can be better organized for the New Year! You have multiple chances to win and a chance to gain more entries every week! To take advantage of the B1G1 sale, purchase a printable through the Etsy shop. In the comments section of your transaction, please state which free printable you would like to receive. Your free printable must be of equal or lesser value. Please note: The B1G1 sale does not apply to the family binder or coupon binder to the shop. Week One will have THREE winners. Each prize package is worth $40. Your printables will arrive to you in PDF format via email. The entry form will be open from 12am EST January 1, 2013 until 1159pm EST January 12, 2013. Special thanks to… Color Me Crystal, Coupon Queen that Saves the Green, The Mommy Island, Living at the Whitehead’s Zoo, Pixie Dusted Homeschool, Pittsburgh Frugal Mom, Enchanted Savings, Family, Love and Other Stuff. Frugal Fanatic, Mommy Needs Her Coffee, Two Girl$ and $ome Coupon$, Giveaway Bandit, and Krazy Coupon Club … for making this giveaway a success!! Going to the gym more often! I am looking forward to another year of fun and love! I have so many for 2013!! Quit smoking,start to work out again,limit alcohol and meat.Be more patient!! I am looking forward to a year full of success and happiness in 2013. I am looking for restoration this year. I’m going to be a Grandma in April. Can’t wait. I’m looking forward to my granddaughter’s 1st birthday on January 12th! I’d like my get my house done over with new floors.